Securing devices with 24/7 mobile data access has become an ever increasing concern, both from a consumer and an enterprise point of view. According to the latest market study by Juniper Research, more than 80 percent of the total enterprise and consumer owned smartphone device base will remain unprotected through 2013 -- despite a steadily increasing consumer awareness of mobile security products. 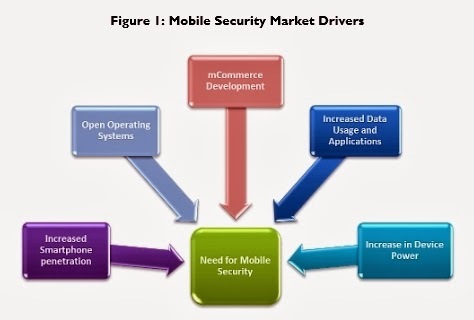 Their study found that nearly 1.3 billion mobile devices -- including smartphones, feature-phones and media tablets -- are expected to have mobile security software installed by 2018, that's up from around 325 million this year. The study also found that security risks are on the rise, due to an explosion of mobile malware over the last two years. It found that cyber criminals are transitioning their focus from PCs onto the mobile platform -- across both enterprise and consumer segments. These findings support Trend Micro’s data showing that that there will be more than 1 million malwares in the market by the end of this year. Nevertheless, the study findings asserted that steadily increasing consumer awareness, allied to far greater visibility of product adoption levels, had resulted in rapid service adoption during the second half of 2012, leading to higher than anticipated service revenues. Juniper found that growth in the enterprise space for security products is being fueled by a number of factors, including increases in IT budgets and greater implementation of security policies and security products; along with training for employees. However, with the trend of BYOD (Bring Your Own Device) where employees bring their own computing devices to the workplace becoming increasingly common, a single policy or measure may not be sufficient and a unified perspective on mobile platform risks is critical.